Hey guys this is Jimbercane posting. First off all, I would like to apologize for posting the following information late. I had many tests this week, so I was really busy studying my notes in real life. Anyways, the title of this post basically says that there are some updates, so lets get started. First off all, there is a huge party going on in Lake Cazmo. The party contains encore concerts of the fabulous band School Gyrls! There are also some new NPC’s over there. The first one is the Bargain Turtle. He lets you buy your own tube, which you can use to swim in the Lake more efficiently. Then there is Llyod who lets you play this little game from which you can get a prize if luck is on your side! To play the game, you must pay 150 Cazmo Coins though. Next, there is a new Cazmo Of The Week, and her name is Sgirl20! Congratulations Sgirl! 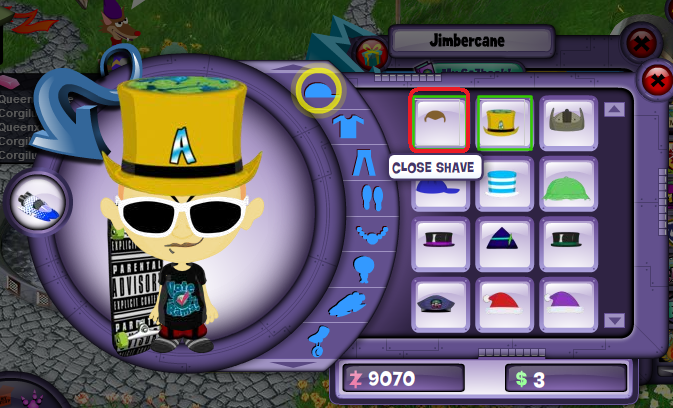 Next, there is a new Mod Gift, and this time it’s a Hair Style; It’s name is Close Shave. Next, the Report Button has now changed. 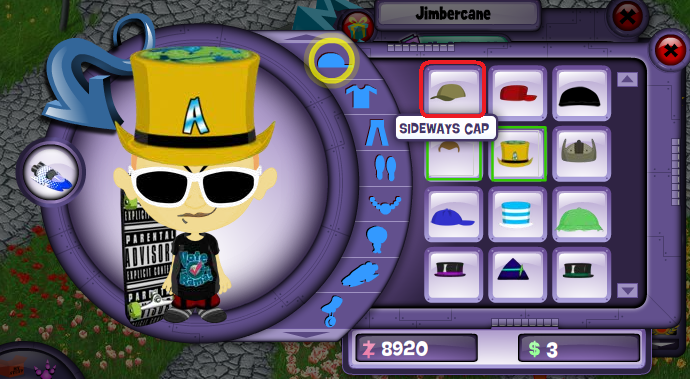 It now shows a picture of an Ambassador Hat. 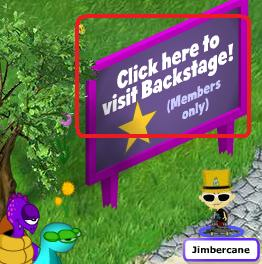 Next, today when I was on Planet Cazmo’s Log-In Page, I noticed that the banner on the top had been updated. It now gave information about the Encore Concerts of School Gyrls! The concerts will be taking place in Lake Cazmo. Finally, today when I was on Planet Cazmo’s Twitter Profile, I noticed that on their latest tweet they mentioned that Soulja Boy will be performing next week for Earth Day! Cazmo Cash As A Gift! 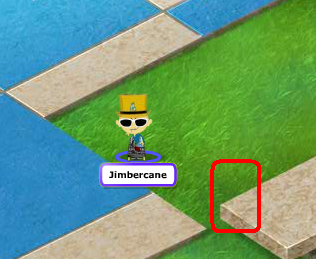 Hey guys this is Jimbercane posting. Today when I was on Planet Cazmo, I noticed that there was a new article in the Newspaper. 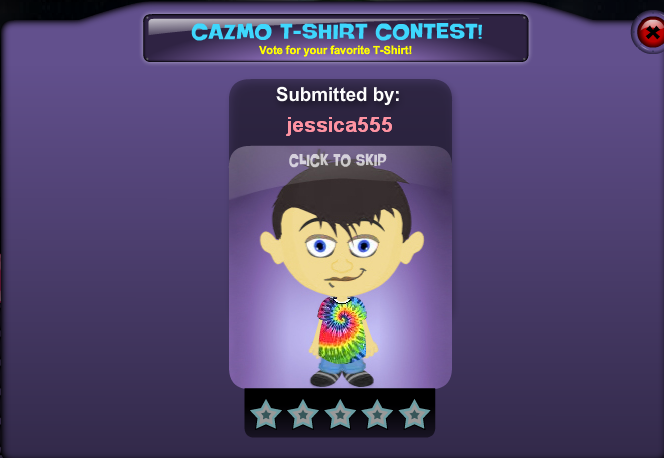 It stated that now you can gift Cazmo Cash to your buddies! (Obviously with your parents permission.) 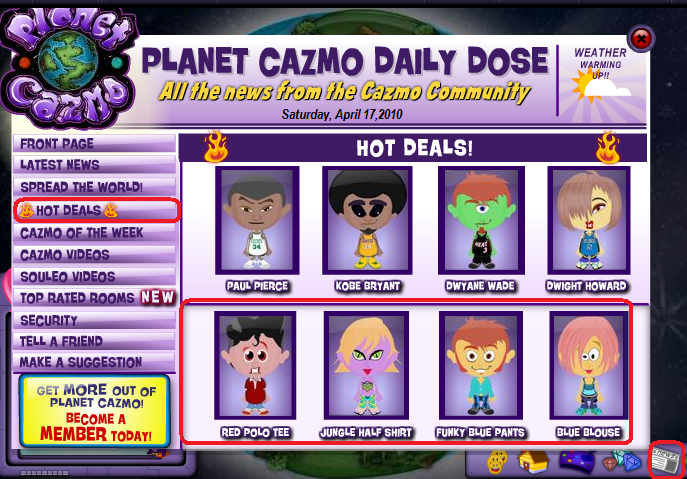 All you have to do is email Planet Cazmo at info@planetcazmo.com, stating how much Cazmo Cash you would like to gift, and to whom you would like to gift it to. Add me as a freind on Myspace. Update: I forgot to mention that there is also a new Mod Gift. 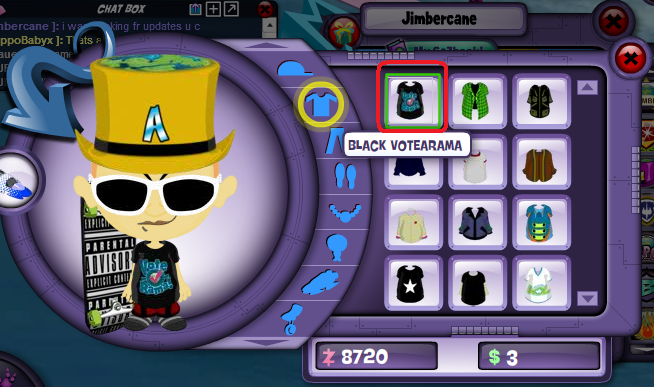 It’s name is Black Votearama! Hey guys this is Jimbercane posting. The title of this post basically says what you are about to read today, so lets get started. First off all, there are some new Hot Deals. To buy them first click on the Newspaper Icon on your Chatbar or your Mini-Chatbar. 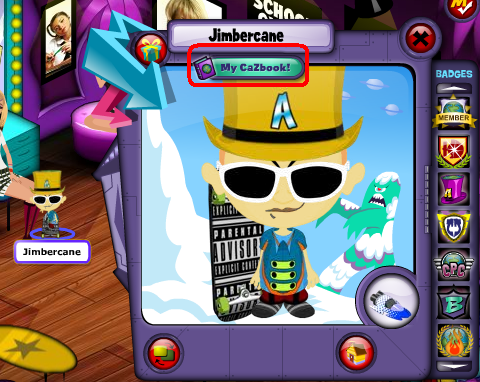 (Your Mini-Chatbar is visible right when you log on to Planet Cazmo.) Now click on the section on the left called Hot Deals, and now you should be able to view all of the new Hot Deals! Hover over what you like and click on it to buy it. Today when I was at the Town Square, I noticed that the NPC who sells you some of the best items on Planet Cazmo for the least possible price, (Let’s just call him the Bargain Turtle since I don’t know his name :).) was not there. I looked to see anything else I could find where he normally stands, and I saw a sign which says ‘Gone Fishin’. Finally, I was on Planet Cazmo’s Twitter Profile today, and I noticed that on their latest tweet they stated that Planet Cazmo is holding a Video Party this weekend in the Cazmo Rena! Some of the people who you should expect to see their include: Justin Bieber, and Taylor Swift! 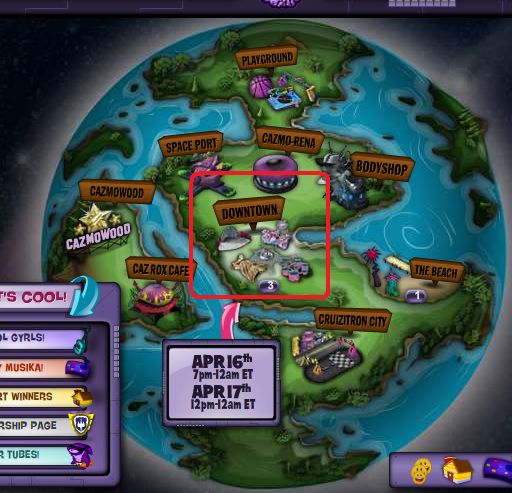 Planet Cazmo Easter Egg Hunt 2010 Guide! 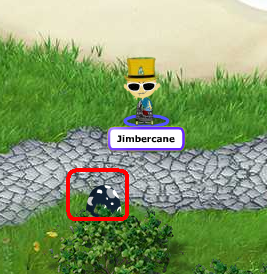 Hey guys this is Jimbercane posting. The title of this post basically says what you are about to read today, so lets get started. There is a new quest, and it is called the Easter Egg Hunt 2010! To start it, first click on the Map Icon on your Chatbar. 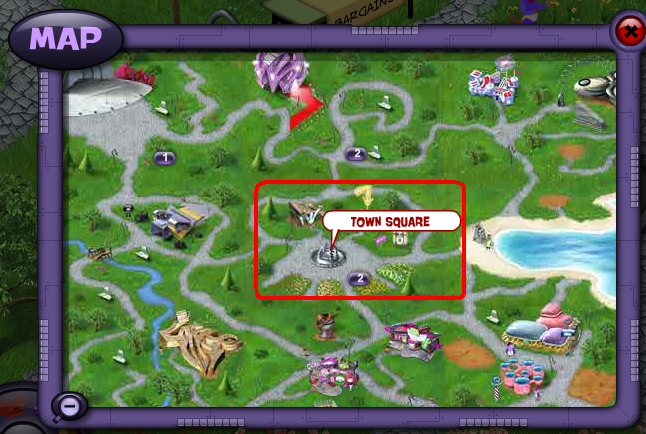 Now, click on the location on your map called Downtown, and then Town Square. As soon as you reach the Town Square go up, because the NPC who lets you start this quest is in the upper area of the Town Square. Speak to him and select the first option. After you do this, you will officially start the quest. The first Easter Egg is near a bush which is somewhere in the bottom area of Lake Cazmo. 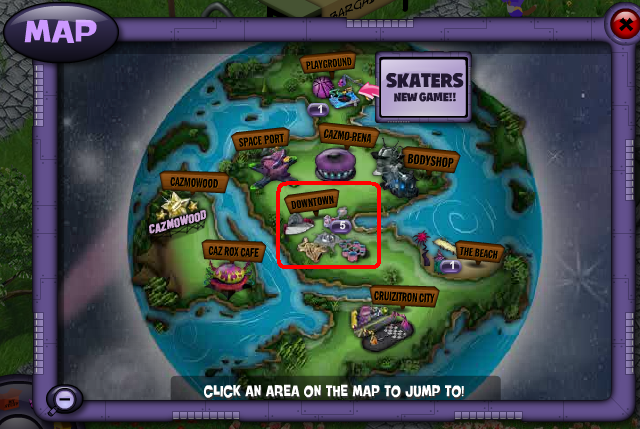 The next Easter Egg is in the Skateshop. The next Easter Egg is in the upper section, above a tree, in the Cazmo Mall. The next Easter Egg is in the Disco Area. For those of you who don’t know how to get there here is a little guide: Go to the Playground, and then click on the arrow in the bottom left hand corner of the room. This will automatically take you to the Disco Area. 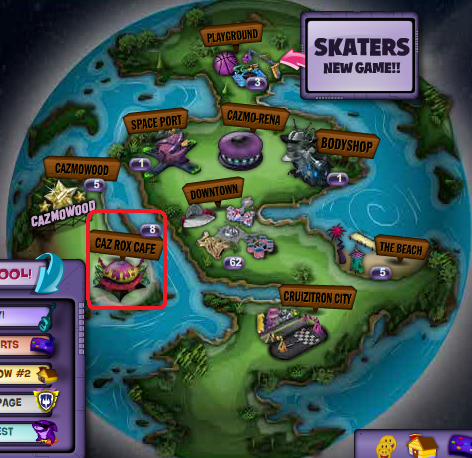 The last Easter Egg is in the top left hand coner of the Cazmo Mall behind a building. After you have completed the quest, go back to the Town Square and speak to the NPC who gave you the permission to start this quest in the first place (The red egg.) for your reward. 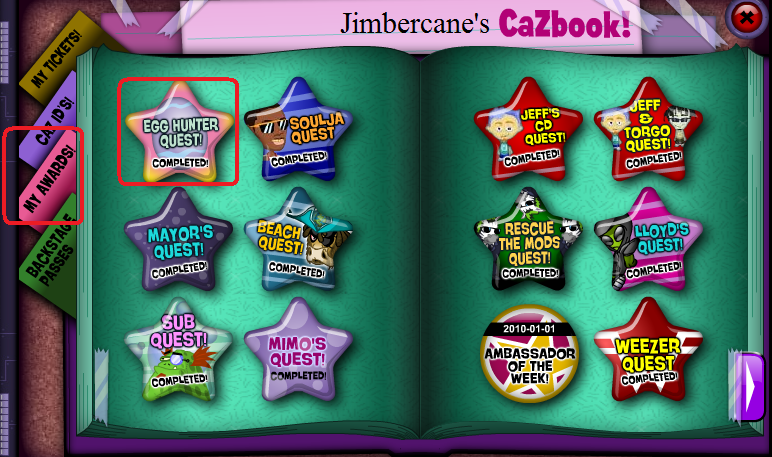 As you will notice, the reward is some Cazmo Coins and a Badge which is added to your CazBook. To view your new badge, first click on your Cazmo. This will open up your Playercard. Now click on the button on the top called My CazBook. Doing this will open up your CazBook. Now click on the section on the left called My Awards. Now you should be able to view all of the Badges that you have gotten in the past, as well as your newest one; The Easter Egg Hunt 2010 Badge! 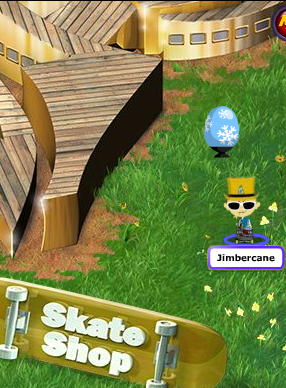 Finally today when I was at the Skatepark, I noticed that the NPC from the Skateshop was there! If you speak to him, he asks you if you want to play Musika. New Cazmo Of The Week & Some Updates! Hey guys this is Jimbercane posting. First and formost I would like to apologize for posting the following information a bit late. You guys know how it is 😉 Anyways, the title of this post says that there are some updates, so lets get down to business. First off all, there are some new Hot Deals. To buy them, first click on the Newspaper Icon on your Chatbar or your Mini-Chatbar. 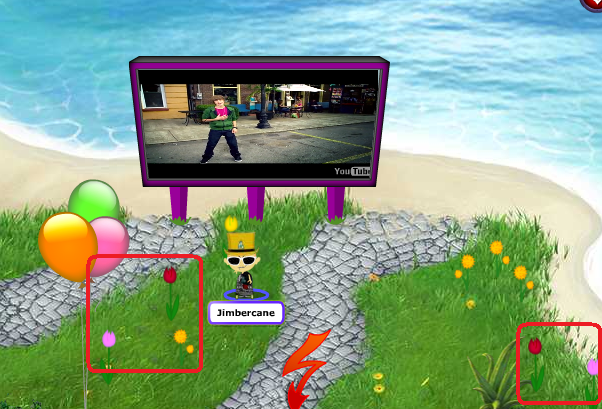 (Your Mini-Chatbar is visible right when you log on to Planet Cazmo.) After doing so, click on the section on the left called Hot Deals. You should now be able to view all of the new Hot Deals. Hover over what you like and click on it to buy it. 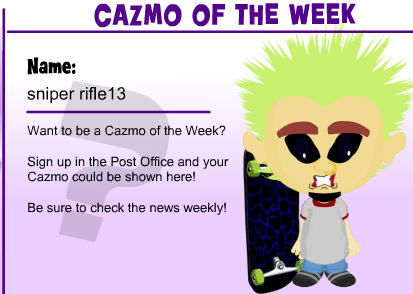 Next there is a new Cazmo Of The Week, and his name is sniper rifle13! Congratulations sniper! If I were you I would watch them perform because of that ‘School Gyrls Concert Ticket’. 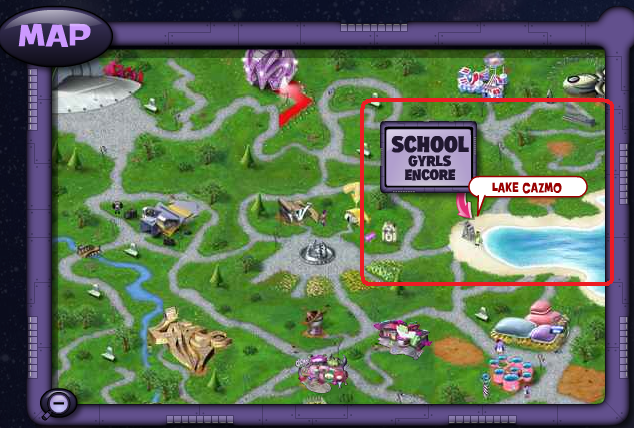 If you are a member go to the CazRox Cafe right now and get your School Gyrls VIP Backstage Pass. 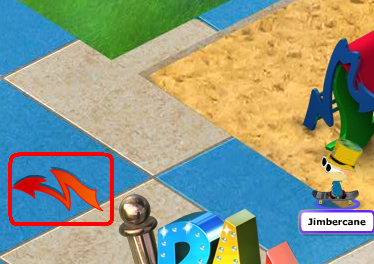 If you don’t know how to get it, then here is a little guide: First click on the Map Icon on your Chatbar. Next, click on the location on your Map called CazRox Cafe. It doesen’t matter which CazRox Cafe you choose, just select anyone. After you are there, go to the VIP Backstage Area which is some where in the top left hand corner of the room. After you go in there speak to anyone of the girls, and select the option ‘Can I Have Your Autograph?’ Doing this will automatically give you the Pass. To view your Pass, first click on your Cazmo. This will open up your Playercard. Now click on the button on the top called My CazBook. Doing this will open up your CazBook. 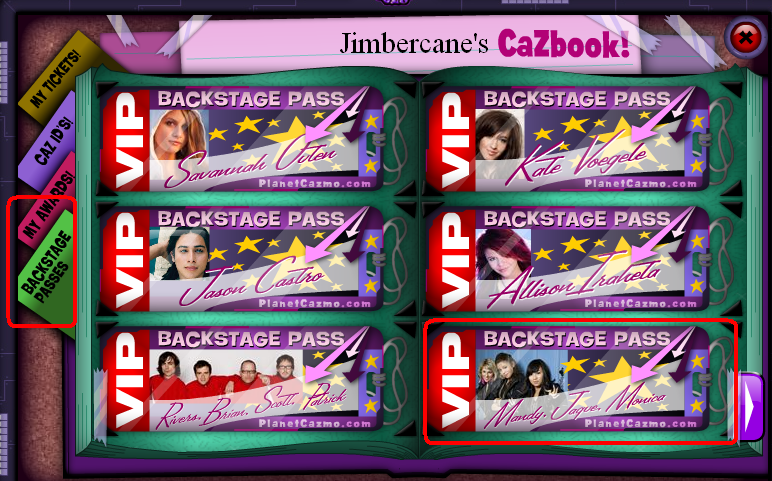 Now, click on the section on the left called Backstage Passes, and now you should be able to view all the Passes that you got in the past, as well as your newest one; The School Gyrls VIP Backstage Pass. 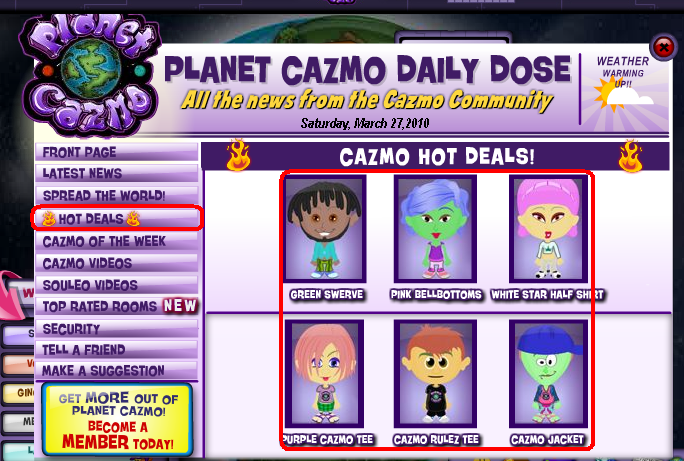 Earlier today when I logged on to Planet Cazmo, I noticed that there was something added to the What’s New Box. 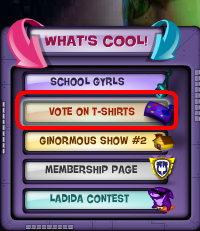 This new feature, was the ability to vote on your favorite t-shirt from the T-Shirt Contest! Yes guys the results are in! Next, the picture of the Weather Icon on the top right hand corner of the Newspaper has now changed a bit. 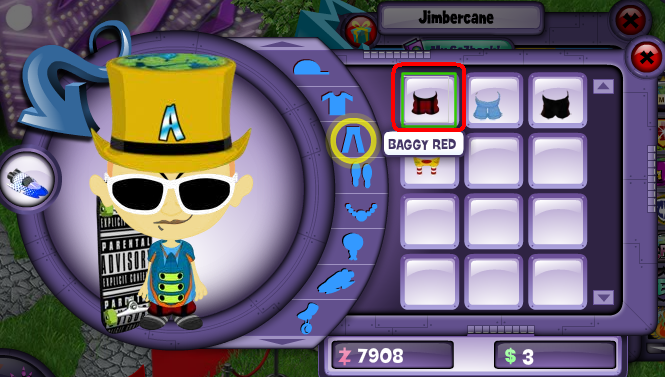 Finally, there is a new Mod Gift, and it’s name is Baggy Red. Friday’s Updates Are Here Today! 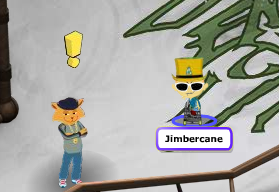 Hey guys this is Jimbercane posting. Before you read any further, I would like to apologize for posting these updates a bit late. I was banned from going on the computer yesterday, and therefore there was no possible way that I could post the updates yet even look for them. Anyways, the title of this post basically should say that there are some updates, so lets get cracking! First off all, there is a new contest going on and it’s name is the Ladida Contest. If you wish to participate in it, it’s great! The winners of this contest will be able to sing in there own virtual concert! Next, Ginormous Ridonkulous is back with 2 new cazmo guest stars: Themick777 and Sacred! Next, I was at the Town Square today, and I noticed that there was a new NPC there! 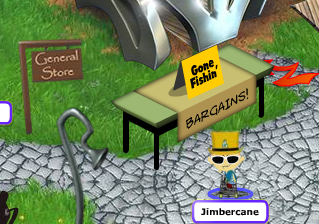 This NPC will give you great deals on some of the coolest item on Planet Cazmo! It is said to check back every Wednesday. Next, there are some new Hot Deals. To purchase them, first click on the Newspaper Icon on your Chatbar or your Mini-Chatbar. 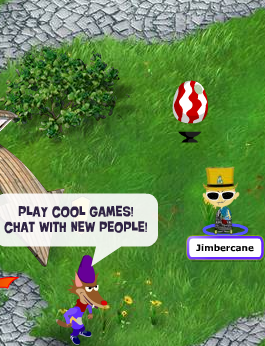 (Your Mini-Chatbar is visible right when you log on to Planet Cazmo.) After doing so, click on the section on the left called Hot Deals. Now you should be able to view all of the new Hot Deals. Hover over what you like, and click on it to buy it. Next, there is a new Mod Gift, and it’s name is Blue Samurai. 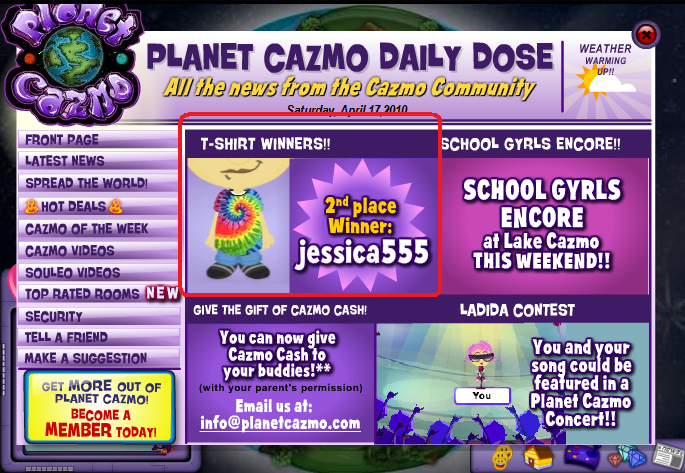 Finally, today is the last day that Jason Castro will be performing in Planet Cazmo. He will start at 12 in the afternoon and play until 12 midnight. He will play once every hour. If I were you, I would go and watch him perform because of that Jason Castro Concert Ticket! Also, to all memebers who are having trouble getting that Jason Castro VIP Backstage Pass, please look at the post below named ‘Friday’s Updates Are Here!’.